Is it time to remodel your kitchen? Well, before you race to your television or computer to watch every home improvement show around, you might actually consider hiring Built by Grace instead. 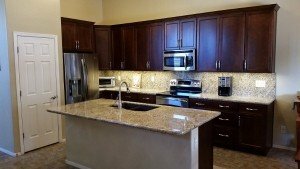 Why Hire Built by Grace For Kitchen Remodeling? It is always a good idea to hire a professional kitchen remodeling service like ours because of several factors. It all boils down to experience, know how, and personnel. First off, Built by Grace has more than enough people to make your kitchen remodeling project go smoothly. Our kitchen remodeling contractors will come in and take care of your kitchen. A good kitchen remodeling project should always be consultative. Someone who is 5″4 and left-handed will have a different set of requirements for their remodeling project than someone who is 6″2 and right handed. One size does not fit all with a good kitchen remodeling. Look at cabinets as a good example of this. How important are cabinets as part of a kitchen remodeling project? Well almost 30% of a kitchen remodeling project is cabinetry and hardware. Kitchen cabinets should be both functional and decorative, and most importantly of all, properly installed. In fact, cabinet installation is one of Built By Grace’s specialties. Installation is about 25% of all kitchen remodeling. Good kitchen cabinets are never cheap. If you buy them and someone does a second rate job of installing them, you’re actually losing money because you will have to call in a kitchen remodeling service to repair any damage that’s been done during the installation process. It’s actually better to call in a kitchen remodeling contractor to do it right the first time. One thing that a professional kitchen remodeling service will do for you is help you to redesign your kitchen. One important thing to consider when designing a kitchen is placement. You want to make sure that water using appliances are near the water lines, or be prepared to spend more in placing a plumbing line somewhere else. You also want to make sure that cabinets are designed for whoever is going to be using them the most, or have a compromise. To achieve the dream kitchen that you want, first off, have an idea of what you want to do with your space. Analyze your existing kitchen, and be sure to take measurements. Figure out what elements of your kitchen you wish to keep and wish ones you wish to replace or upgrade. Make a list of everything you’d like to see in your kitchen remodeling from the simple elements to expensive overhauls. Take a look at other successful projects if you need even more ideas. Check out your friends and family’s homes. Make sure you are aware of the fact that professional kitchen remodeling isn’t done in ten minutes as a rule. Make sure you know that you may not be able to use your kitchen for days or even weeks depending on the project in question. One of the most important parts of any kitchen remodeling plan is knowing your budget. Without a clear budget, you’ll have trouble determining whether you’re making a sound investment. Come up with a firm number for the overall remodel first. Have realistic expectations. Once you have decided on the general layout of your kitchen, you will need to make decisions about the various components that will go into it. This is where the big spending is going to happen, so you need to choose wisely. An integral part of any remodel, there are many choices for kitchen cabinets and countertops. But what about plumbing? Depending on the quality and the material, you can purchase a new kitchen sink for less than $100. When shopping for a new sink, look at features like extensions, sprayers and soap dispensers. The flooring that you use in your kitchen needs to be practical. A kitchen is no place to put carpet in. Laminate flooring is cheap, as are vinyl, linoleum, and ceramic. You can make up for a lot of limitations by using the right lighting. Hire a professional to help you with this aspect of your kitchen remodeling project. With a track lighting, recessed lighting and other options, it’s possible to make even a compact kitchen look and feel roomy and elegant. Be practical about where switches are installed too. They should be placed in intuitive places to make it as easy as possible to get around in the kitchen. Hiring Built by Grace for a kitchen remodel is a great idea as kitchen remodeling can involve a surprising number of specialists, depending on its scope. That’s why you work with us. We have a wide range of talents among our crew, and some of them have more than one area of specialty. So remember, there’s a lot to any remodeling project. Just remember, call Built By Grace for your kitchen remodeling project.